who build first-rate mobile apps. Michał Łukasiewicz - a Co-founder and Managing Partner of Bright Inventions. An idea guy and a software engineer with more than 15 years of experience. Appreciates clever technical solutions and simplicity. Works 20 hours a day and still finds time for his family. Daniel Makurat is a Co-founder and Managing Partner of Bright Inventions. Experienced developer with a broad skill-set. Backend specialist. He likes to run interesting discussions and suggest non-standard solutions. Family guy, books lover and coffee addict. Piotr - A Man Dancing with the Code. Piotr is a real full stack developer with over 12 years of professional experience. Backend APIs, distributed systems, databases are only some among his main fields of interests. Always up-to-date. Always focused. Always asking "Why?". Mateusz - passionate about agile software craftsmanship. At work focused not only on writing clean code but also on teamwork and soft skills development. iOS lover keen on Android development and project management. Privately, a great fan of fantasy books and geek humour. Adam - a fan of order and structure. He started his career with some simple PHP websites. Later on he touched on .NET, Ruby, Java and Objective-C, but he has always come back to the Web which is his true love. Enjoys maps & mapping, and exploring the world with his family. Agnieszka strongly believes that experience is gained by learning and perseverance regardless of your title. She used to think that backend with data modelling is her only love. Now exploring new challenges in web frontend and mobile apps. Privately, a mum of a lovely daughter and a climbing lover. Andrzej after a few years of experimenting in Java discovered his passion for Kotlin and Android development. Always seeking for optimal solutions. Obsessed with networking and administration stuff. In free time he crushes his enemies in video games. Ula - people-centered, positive and scrutinous. Ula is a philologist and social media enthusiast. She believes in success through self-developing, hard work and dedication. After hours English teacher, bike addict and amateur chocolate taster. Radek - after being a pub manager for a few years, he decided to become a programmer and hasn't looked back ever since. Now specialising in Kotlin on Android. Loves creating new things - either it is developing a new application or cooking a fancy new dish for friends. Grzegorz drinks mate all day and cannot sit in one place. Student of Computer Science at Gdańsk University of Technology and backend lover. His primary interests are TypeScript and Java. In spare time he plays strategic games or explores the woods. 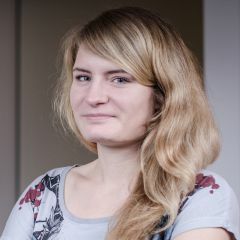 Agnieszka is a Sales Manager who believes that communication is the main stream which leads to success. Privately keen on travelling and exploring new cultures. For last four years involved in IT Sales environment. Artur - Swift and Apple lover. Interested in Blockchain. Great fan of Elon Musk. Always positive. In spare time fond of exploring Scandinavian countries and watching his favourite football team from Manchester (the red one :)). Łukasz is an Android developer, a great Kotlin fan and Automatic Control and Robotics post-graduate. Always open for new ideas and constructive criticism. Hobbies? All kinds of sport (karate, running, swimming, skiing and others). Music lover. Radek is an Android developer passionate about deep learning. Recently fascinated by Spring Boot. Radek believes not only in clean coding, but also in clean eating. Privately keen on healthy diet and gym. Loves learning new things and solving problems. Bartek believes that there are no things we can't learn. Before starting his adventure with programming he had spent a few years on the North Sea as an electric engineer. Then he met his true love - Swift. After work enjoys biking and mountain trekking. Ivan - Linux fan and open source freak. At Bright Inventions responsible for backend projects. Interested in drawing pixel art and DYI stuff. Lives in Poland since February 2015. After relocating from Ukraine he decided to settle in lovely Tricity. Marcin is a full stack developer who can't resist learning new technologies. Loves ShuHaRi approach and believes that programming languages are just tools and everyone can learn them. After work a happy husband and father of two daughters. Karol - an ambitious young iOS developer and one of the most ardent Swift lovers. Karol is persuing his BS in Computer Science and at the same time exploring the world of mobile development. Favourite activities include football, all kinds of water sports and Tarantino movies. Kasia is an Agile romantic with a scientific mind and a zeal for learning. She divides her time between university teaching and enhancing project management processes. Believes in people-centered processes and the power of retrospective. Loves music and good food. Privately, a mum of two wild boys. Szymon is a Kotlin and TypeScript enthusiast. At Bright Inventions he uses his never ending energy to work on mobile and web solutions. Active learner, globetrotter, sports lover. Getting itchy feet every morning - the one and only thing keeping him fascinated for longer time is programming. Alisa armed with a background in business communication continued her university education with graphic design. She loves working closely with clients and creating things that are not only pleasure to look at but also give some extra business value to products. An optimist, travel addict and adventure seeker.